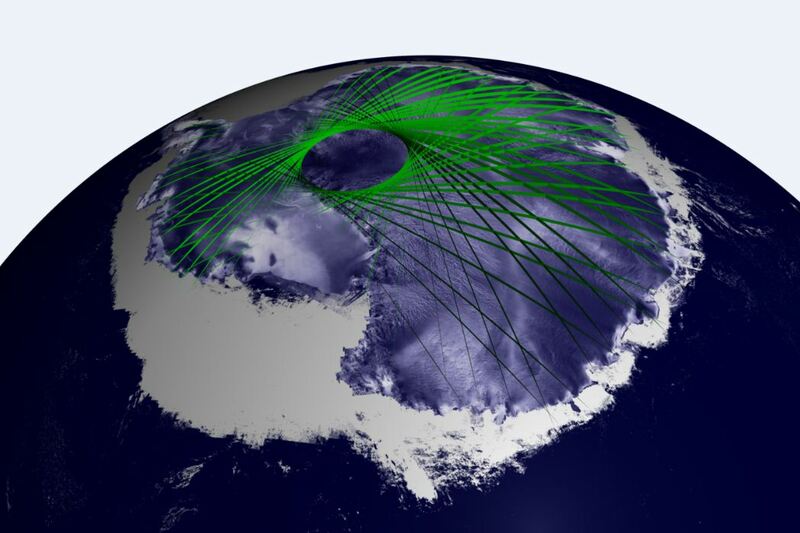 ICESAT Data Shows Mass Gains of the Antarctic Ice Sheet Exceed Losses | Watts Up With That? The results of ICEsat measurements are in for Antarctica, and it seems those claims of ice mass loss in Antarctica have melted now that a continent wide tally has been made. This was presented in the SCAR ISMASS Workshop in Portland, OR, July 14, 2012 and was added to NASA’s Technical Reports server on September 7th, 2012. H/T to WUWT reader “Brad”. What’s interesting (besides the result) is that the report was prepared by Jay Zwally, whose “ice free Arctic by the end of summer 2012” prediction is about to be tested in 12 days. 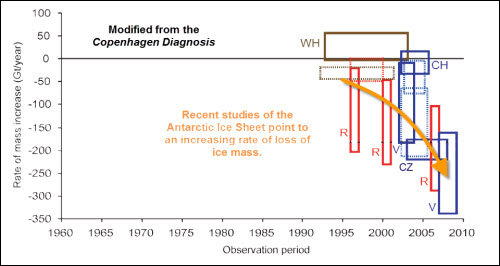 It also puts the kibosh on GRACE studies that suggested a net loss in Antarctica. Note there’s the mention of the “climate warming, consistent with model predictions” at the end of the report. They’d say the same thing if ICEsat had measured loss instead of gain, because as we’ve seen before, almost everything is consistent with warming and models no matter which direction it goes. Here’s the video presentation. The report abstract follows. Imbalances in individual drainage systems (DS) are large (-68% to +103% of input), as are temporal changes (-39% to +44%). The recent 90 Gt/yr loss from three DS (Pine Island, Thwaites-Smith, and Marie-Bryd Coast) of WA exceeds the earlier 61 Gt/yr loss, consistent with reports of accelerating ice flow and dynamic thinning. Similarly, the recent 24 Gt/yr loss from three DS in the Antarctic Peninsula (AP) is consistent with glacier accelerations following breakup of the Larsen B and other ice shelves. In contrast, net increases in the five other DS of WA and AP and three of the 16 DS in East Antarctica (EA) exceed the increased losses. Alternate interpretations of the mass changes driven by accumulation variations are given using results from atmospheric-model re-analysis and a parameterization based on 5% change in accumulation per degree of observed surface temperature change. A slow increase in snowfall with climate warming, consistent with model predictions, may be offsetting increased dynamic losses. Estimates of recent changes in Antarctic land ice (Figure 2) range from losing 100 Gt/year to over 300 Gt/year. Because 360 Gt/year represents an annual sea level rise of 1 mm/year, recent estimates indicate a contribution of between 0.27 mm/year and 0.83 mm/year coming from Antarctica. There is of course uncertainty in the estimations methods but multiple different types of measurement techniques (explained here) all show the same thing, Antarctica is losing land ice as a whole, and these losses are accelerating quickly. I’m glad that’s finally settled. Polar Amplification means the temperature in polar areas move faster during both cooling and warming period. This is attributed to the positive feedbacks from the retreat of ice and snow and other lesser reasons, but there are the extra factors currently not acounted for. You see? Data shows there’s no reason for alarm. Yikes! Global warming is moving ice from the North to the South Pole! If we don’t rein in emissions within 10 years, the planet will reach a tipping point, I mean it will literally tip over. Or maybe not, but with all that ice in Antarctica Earth could get too heavy and fall from orbit! Please send me 25 gigadollars and I’ll provide a solution to the underlying problem. Hey Al – any comment? As I said: by 2035 all the ice in arctic will also be back. But……do we really want the cold? Why not add more CO2? Every discussion of ice loss in the Arctic which references “global” warming or climate change is incomplete unless it includes at least a mention of the “global” ice balance. The current low ice levels in the Arctic seem to be balanced by the increases in the Antarctic. This strongly suggests that the Arctic changes reflect a global shift of heat energy from the northern hemisphere to the southern. Ocean currents suggest themselves as a unifying explanation. Occam’s razor says one should look for the one explanation that explains all data. Sometimes Occam does not apply, but it should always be considered as a part of good science. To say that the Arctic ice loss is due to CO2-related AGW, but that the ice increase in the Antarctic is due to something else, defies this time-worn principle. from article: It also puts the kibosh on GRACE studies that suggested a net loss in Antarctica. Note there’s the mention of the “climate warming, consistent with model predictions” at the end of the report. They’d say the same thing if ICEsat had measured loss instead of gain, because as we’ve seen before, almost everything is consistent with warming and models no matter which direction it goes. I read ScienceDaily and Science New sites daily, and I’ve noticed for years the use of the statement and its ilk as cited above for climate articles [but not limited to that direct subject] as they satisfy or pander or prostitute for funding. What this says to me is that changes are going on in the dynamics … its not only a simple matter of net mass loss or gain … it as important to consider the changing dynamics of the system. This result in consistent with the Jason GMSL data which if graphed as a rate of changle in GMSL and plotted as 12 month average reveals that the rate has dropped from 4 mm/yr to almost zero now since 1998. So, problem solved. All we need is a huge pump and a pipeline connecting the two poles, and then we redistribute the white stuff. hmmm. So snow increase is due to AGW. Who would have thought land ice mass increases with anthropogenic global warming? Such a sad thing. Tsk, tsk. Wonder what caused mass to grow before? Since the article seems to imply that AGW snow (something children are not supposed to know about?) is causing it now sooooo something else must have caused it back then, do you suppose it was the Ice Queen whut dun it? Seriously, snow is a weather event. The only way snow occurs is if the weather sets it up to snow. Weather caused it back then, and weather is causing it now. Weather, within climate boundaries has both short term and long term pattern variations. And sometimes, these weather pattern variations kill and sometimes they allow life to bloom. My hunch is that both sides of the coin are necessary to sustain planetary life. Drought and rain, cold and warm, ice and melt. The problem is that humans tend to only believe what they themselves wish to learn. We hardly consider the learning of those that have come before, believing their knowledge to be quaint and outdated. In other words, we do not learn from the past and we do not increase in wisdom because of it. We only go round in circles. Bet this news will not adorn the front cover of Nature (a la Steig), neither will it feature on MSM or, indeed, AR5. Am I reading this right ?..” Because 360 Gt/year represents an annual sea level rise of 1 mm/year, recent estimates indicate a contribution of between 0.27 mm/year and 0.83 mm/year coming from Antarctica.” So that means Antarctica may contribute as little as about an inch per century to sea level rise? Another negative feedback mechanism. As ice moves to the southpole, it will tip toward the sun and increase albedo when earth is closest to the sun. I think I’ve got it now. When the ice is melting, it’s catastrophic global warming. When we’re gaining ice mass, it’s consistent with global warming. At first it didn’t make sense, but if you repeat it often enough, it just rolls off the tongue. LOL – Yeah, but it is only a small area, the Arctic is the BIG worry…….all that FLOATING ice…..
Like Guam with too many military personnel, Antarctica faces the prospect of tipping over on account of its unbalanced ice fields. Just as predicted by all the models. One has to appreciate they’re honest. If they find the ice is decreasing, they report the ice is decreasing. If they find the ice is increasing, they report the ice is increasing. If they can’t match the data from different sources, they report they can’t match the data. That’s ok by me, that’s how science is done. Both ICEsat and ERS measure the surface altitude and subsequently the volume, not really the mass. GRACE measures total mass. They only contradict each other based on a number of assumptions, such as that the ice density doesn’t change. One of possible mechanisms for Antarctica to gain ice and to lose mass at the same time would be that there may be numerous caverns filled with water all over the Antarctis and they are now freezing over, increasing the total volume without adding to mass … accompanied by overall loss of mass all around the edge. But I’m no scientist to place such hypotheses. And of course, there’s no wonder they find models that agree with observations. It’s long known fact that a guaranteed way how to get a successful forecast is to generate sufficient number of different forecasts. Our climate modellers have been very active in that direction in recent years. It’s that time of year. Spring and Fall as the Northern and Southern hemispheres prepare to switch seasons, contradictory predictions are made by the CAGWers about what will happen at the poles due to Man’s CO2 emissions. At the end of winter/summer the prediction that most closely matches what is actually observed will be trotted out as proof we need to shut down more power plants and spend more money to research the “crisis”. (Sometimes “actually observed” is on a computer screen rather than actually measured.) Whichever end is melting usually gets the most press. Bogus predictions are forgotten (except for places like WUWT) or explained away. This benchmark means GRACE will have to re-tune itself. When that happens, what other measurements will have to be readjusted? Someone should keep after them about this. Am I reading this right ? … So that means Antarctica may contribute as little as about an inch per century to sea level rise? Yes, but think of the children: how will they cope with a disaster of such extreme seriousness? Wait, the data has not been “corrected” yet. I give it 2 months – a new paper will come out of the pseudoscience mills showing almost exactly the opposite. Don’t worry – they will all go back to the 70’s – platform shoes!!! Zwally et al’s analysis is based on laser measurement of the elevation of the Antarctic ice sheet. Analysis of that data indicates the Antarctic ice sheet is gaining mass. If the Antarctic is gaining mass how does one explain increasing sea level from the GRACE satellite measurements and decreasing Antarctic mass from the GRACE measurements? The GRACE satellite measures mass indirectly by measuring changes in altitude as the GRACE satellite pair move about the earth. It has been known for sometime by the US and Russian intercontinental missile testing results that something inexplicably effects missile trajectory which requires mid launch correction for precision impact results. The something that changes missile trajectory is the sun. The suns effect on low level satellite orbits is the same reason (same mechanism) that is causing a sudden increase in earthquakes and volcanic eruptions. The GRACE measurement change has nothing to do with mass change. The ocean levels have not been changing. Analysis of data from tidal gauges at multiple locations does not support a rise in ocean level. In an interview and paper published in 21st Century in 2007, I have shown that global sea level is not in an alarming rising mode, which is the main threat in the International Panel on Climate Change scenario. If sea level is not rising at a high rate, there is no serious threat and no real problem. In subsequent papers, I continued to present new data on sea level stability. In Mörner 2007b, our field observational database from the Maldive islands was described in detail. A new study in Bangladesh was published in 2010 (Mörner 2010a). New data with respect to general sea level changes were published in another paper (2010b). The interview and article appear in the Fall 2007 21st Century THE GREAT SEA-LEVEL HUMBUG There Is No Alarming Sea Level Rise! by Nils-Axel Mörner One of the approximately 1,190 beautiful coral islands that comprise the nation of the Maldives. As Mörner shows, the Maldives are not in danger of inundation. …short sea level booklet titled “The Greatest Lie Ever Told” (Mörner 2007c) was updated in new editions in 2009 and 2010. Here I will investigate the proposed rates of sea level changes by IPCC and others…. Ice sheet? Pshaw! We need to know what’s really important: any Shoggoth sightings at the Mountains of Madness? As near as I can tell, what this is saying is that lower elevation areas and areas near the coast susceptible to global warming are losing mass, and higher elevation areas that see little or no melt but do receive increased precipitation along with warmer temperatures (albeit still below freezing), are seeing net gains in mass. Both results are from global warming. There is no “balance” however with mass gains in the Antarctic and Ice losses in the Arctic. In a little over 30 years, 75% of summer Arctic ice volume has been lost. This leads to less reflectivity and increased temperatures, further continuing the warming cycle. I’m curious to see if the future “cooling” some of the writers on here discuss occurs or if predicted “cooling” is simply absorbed and overwhelmed by the ongoing warming activities of man. Glaciers will grow and surge with increased snowfall. Warmists speculated that warm sea surface temperatures would raipidly melt the glaciers as they entered the Southern Ocean and cause them to surge by melting buttresses. 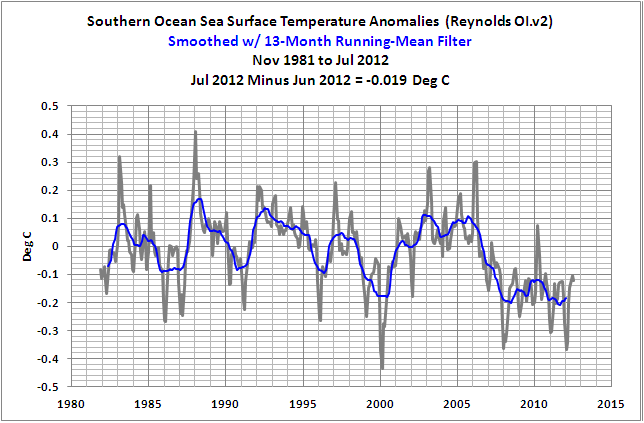 So how is the warm Southern Ocean theory holding up ? No chance of an ice free Arctic. It’s been refreezing at the webcam since the begining of August. So even if the edges are still melting that area is freezing up. So global warming is now causing ice mass increases? … are we all going to die again ? Of course there is no ‘balance’ between the north and south poles. For a start the south pole is over land, and a BIG land mass too – whilst the north pole is over the ocean and affected by warming currents and wind movements. The two differences do show clearly how land mass ice and floating ice differ in their climate responses. Your assumption the Arctic warming and ice loss as manmade is unproven – and the lack of significant widespread warming in the antarctic confirms this to some extent (unless you happen to subscribe to the view that all the CO2 rises to the north pole?!!). In a nutshell, the arctic ice loss may be entirely natural, as may be the variation in the antarctic – you simply cannot prove that CO2 is the cause. All the Arctic ice situation really shows us, is that the sea and air currents have been changing enough to cause melt – why is not clear, but we do certainly know that Arctic ice has been low in the past (before the era of CO2) and hence the current state may well be a natural ‘event’. The problem with Grace is that gravity not only has unknown varibles like density and volume but must also be corrected for GIA (Global isotatic adjustments} that are still occuring as a result of the last ice age ending. Geodetic data (gps) and sesmic velocity surveys are being used to constrain solutions to the problem As more data becomes available we are suprised to learn that Greenland’s center for instance is actually depressing the crust not rebounding like the edges or the rest of the Northern Hemisphere. Antarctica is even more problematic because of the lack of geodetic data. Yes, ice is INCREASING. There goes that asinine ‘it’s losing ice’ argument down the toilet. Vukcevic for one will be more than a little interested in your magnetic / temperature hypothesis. Vuk does have an interesting graph on the subject himself. Any chance of an article on WUWT in the not too distant future ? Interesting bit at your link, thanks for posting it. Though I’m a bit at a loss as to whether or not the non-linear relation between W/m^2 and Kelvins is acknowledged in the standard account. All things being equal, small flux changes due wind and water currents will have a larger T delta at the poles rather than at the equator. Due the axial tilt this should exacerbate things beyond the Arctic and Antarctic circles. The singular difficulty is that at high angles of incidence, as found above the Arctic and Antarctic circles, the reflectivity of water can trivially exceed the albedo of ocean ice. This doesn’t mean the standard account is wrong per se, but that there are trivial issues that are not often spoken about. you ignored the hadcrut 3 results shown by Smokey? My results show double, i.e average temps have gone down by 0.2 degrees C since 2000. I also predict all ice lost in the arctic being back by 2038. Naw, we know the MWP was a global phenom by looking at global proxies. I’m not a scientist, but I believe they measured the gain in height from satellites, converting that to a mass figure from know snow-and-ice water content analyses, perhaps done on the ground. Don’t know how they compute total run-off from the three major drainages, but they show a net mass gain resulting from the difference, give or take a few billion tons. I’d like to make two points: One is that, given the embarrassment of making a public correction to his earlier study (especially in the direction of a higher net positive), one might surmise that Zwally is pretty sure of his numbers this time ’round. There’s been a net gain. Second, I think this makes sense if the much heralded warming influences of the last year were real. Atmospheric warming would carry more moisture over the interior, depositing greater amounts of (wetter) snow, which would increase the run-off during its compaction. James Sexton, THANKS for that map! Now added to my array of artillery. But what about ice quality? I read somewhere that the antartic is so cold that there is almost no humidity there and almost no precipitations, and that if the antartic where to ‘warm’ from very negative temps to mild negative temps then there would be a net gain in ice mass since then there would be an increase in humidity and precipitation, but no net increase in ice melting since the temperatures would not reach that point yet. On the other hand, temps on the artic are on average much warmer and further warming results in ice loss due to melting. So everything is consistent with increased overall world temperatures: the antartic ice sheet grows and and the artic one retracts. Then the ice extent in the Arctic during the melting season of 1912, was even less than today . Apparently the loss of Arctic Sea Ice caused the almost record breaking rainfall on the UK during the summer of 2012, only exceeded by the rainfall of 1912. How on earth did the arctic manage to recover in time for the satellites to see a maximum extent in 1979? Could it be that the sea ice extent cycles periodically, no matter how many humans are exhaling? Almost ruined my computer with my mouthful of coffee with that one…Ta….. The amount of ice on the polar caps has NOTHING to do with the IMAGINARY increase / decrease in GLOBAL temp; but depends on the availability of raw material, for renewal of the ice deficit. Yes, ice deficit is created by the geothermal heat on tera firma – by the salty currents on the water. Average temp on the the polar caps is minus -30C, that’s twice as cold than in your deep freezer…. May I humbly suggest that phrases like “twice as cold” should refer only to temperatures in Kelvins and not Celcius or Fahrenheit? In Fahrenheit, you’d be talking about something like -20°F and +10°F. Would you say Antarctica is minus three times as cold as my freezer? Ric Werme; – my fridge, freezer and oven are honest. They have temp engraved in Celsius. Calvin is for Swindlers, desperate to complicate / confuse the ignorant – because they only thrive on people’s ignorance and deceits. Rest of you guys: cross the IRRELEVANT zeroes, cut the crap, cut the dead wood, until you get to the solid stuff. Engineers making white goods don’t start from ”ultimate zero” because they have useful products to sell. On the other hand, the Bullshine Merchants use every trick they can think off, to con. Sorry Ric, if you want real proofs, facts and formulas; on my blog. You won’t find there galactic dust, sunspots and other bodies in the zodiac affecting the climate. From Florida to California – there are 50 different climates – are all those places different ‘star signs”? Is the sun creating different sunspots for all those places?! Why Amazon has the ”lucky stars” but on SAME latitude in Australia; birds, animals and trees get mummified and burned in intensive bushfires – because of the COMPLETELY DIFFERENT CLIMATE?! Ask Anthony to explain to you; see where he is coming from. He is scared obviously from my proofs and facts, he must screen / censorship on my comments… ha, haaa, haaaa!!! Models predicted initial mass gain of Antarctc ice sheet because of increased precipitation (snow) due to warming. Check IPCC III and IV, projections chapters. All studies for the 21st century project that antarctic SMB changes will contribute negatively to sea level, owing to increasing accumulation exceeding any ablation increase (see Table 10.6). This tendency has not been observed in the average over Antarctica in reanalysis products for the last two decades (see Section 4.6.3.1), but during this period Antarctica as a whole has not warmed; on the other hand, precipitation has increased on the Antarctic Peninsula, where there has been strong warming. Reported mass gains at Antarctica have been a little surprising in that context, but if ICESat values are robust, the IPCC models will have been verified. OTOH, Antarctica is one of the more difficult regions to predict (a non-intuitive conclusion), so all projections should be handled with care. An important corrollary of these results is the effect on sea level projections, which have in part been revised upwards since AR4 because of the apparent declining mass balance of the Antarctic ice sheet. At the very least these results should intensify scrutiny of the issue. They don’t “put the kibosh” on the issue, as the top post states. That would only be true if we treated this paper as perfect. Hardly a skeptical position. Sea level ‘projections’ don’t matter. The raw Envisat data does matter [and I don’t agree with Envisat detractors. Like this ICESAT paper, Envisat was attacked because it didn’t fit the narrative]. My Goodness now who would have thought that a GAIN in ice in the Antarctic Ice Sheet could still be the fault of climate change/global warming…. Tut Tut!!! Andrejs, there isn’t any humidity on Antarctic; because: Antarctic replenishes her ice by ”FREEZE-DRYING’ the moisture from the air. Same as the old fridges were building ice, without rainfall / snowfall in the kitchen. By opening often the fridge door -> moisture from the kitchen is freeze-dried = ice. Antarctic doesn’t have doors! For 8-9 months in a year, those ”highs” dry / cold winds, billions of cubic kilometers are blowing from Antarctic towards Australia and south Pacific. Instantly, to avoid vacuum on Antarctic – lots of low /moist air goes from Indian ocean, over Antarctic and ”REPLENISHES” the ice deficit. Yes, the shonky ”climatologist” go there – see that is no snowfall and declared Antarctic as the driest continent…?! TRUTH: Antarctic is the wettest continent!! Calvin is for Swindlers, desperate to complicate / confuse the ignorant – because they only thrive on people’s ignorance and deceits. When Lewondowski sought to characterize skeptics as being hopelessly uneducated in the basics of math and physics, not to mention having a couple of screws loose, did he he build some bots to answer his “survey” with complete lunacy and perhaps some of them got away? 1. reference to Jean Dickey of NASA JPL. Thanks for regularly sharing your stimulating volunteer work. 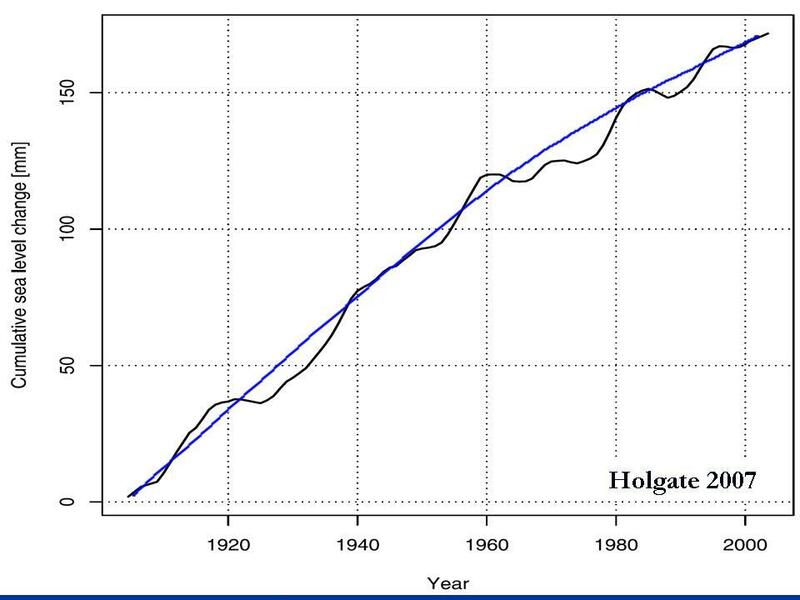 So antarctic ice is increasing, just as the IPCC said it would. Maybe they are making up these results to make the IPCC look good? Unfortunately, your style of making assertions grates on my nerves. I like WUWT for balanced debates, with facts and formulas presented, so I can learn. BTW, may I suggest that the spelling errors on your blog undermines the credibility of your site. The current orbital configuration is characterized by a weak minimum in summer insolation. Past interglacials can be used to draw analogies with the present, provided their duration is known. Here we propose that the minimum age of a glacial inception is constrained by the onset of bipolar – seesaw climate variability, which requires ice-sheets large enough to produce iceberg discharges that disrupt the ocean circulation. We identify the bipolar seesaw in ice-core and North Atlantic marine records by the appearance of a distinct phasing of interhemispheric climate and hydrographic changes and ice-rafted debris. The glacial inception during Marine Isotope sub-Stage 19c, a close analogue for the present interglacial, occurred near the summer insolation minimum, suggesting that the interglacial was not prolonged by subdued radiative forcing7. Assuming that ice growth mainly responds to insolation forcing, this analogy suggests that the end of the current interglacial would occur within the next 1500 years. Actually I’m shocked the way they managed to grow cherry trees in Yamal. You mean Gore? He was thinking about an Antarctic ski trip and asked about the snow bunnies, then decided against it when told there were only blubbery seals and waddling penguins. Envisat had technical problems. I’m not familiar with the disparagement you mention, but it’s rare that satellite instrumentation records perfect data over the long-term. Regardless, the graphic you displayed has 3.5 years of mean sea level data. Envisat was on line for 10 years. What possible reason could there be to excise more than half the data? Because that allows whichever charlatan making that graph to select an extreme anomaly at one end, and an extreme anomaly at the other, and manage to make a trend line opposite in sign to even the unadjusted full data set. Classic cherry-pick, as obvious as a hammer, and no surprise that you brandish it. If you have a yen for Envisat, you might be interested to know that its main contribution to the Antarctic ice sheet question was the recording of the disintegration of Larsen B and recession of Antarctic glaciers. The data from your favourite satellite tends to support the notion of mass loss. Oh, well then, here is one of Envisat sea levels from 12/31/2003 to 6/30/2011. Linear trend would be only 3.4 inches by 2100, but as seen by the 2nd-order polynomial fit, and the Eyeball Mark I curve fitter, the curve has peaked and is heading downward. We have data up to 2012, but your chart, like Smokey’s, ends on the most extreme dip in the record in 2011. And then fits a polynomial trend that I very much doubt would succeed statistical significance tests (I’d guess a quadratice function would be a better fit). How about we go to the source of your source and look at the updated adjusted and non-adjusted data? A sharp uptick in 2012 brings the linear trend back. A 2nd order polynomial fit to this data would probably show acceleration (Eyeball Mark VI) – but I wouldn’t bother trying to show that, because it’s pretty clear just from eyeballing that a polynomial would fail statistical significance tests. I’m looking at the unadjusted data set, BTW, just so we can obviate a diversion into hollow cries of ‘fudging’. Please ignore the adjusted data to that purpose. It’s about as daft to make claims about future sea level rise based on 10 years of observed data, as it is to make claims on that from 9 years of data. It’s not nearly enough to go on – rhetorical value only. I think you’re smarter than that. We have data up to 2012, but your chart, like Smokey’s, ends on the most extreme dip in the record in 2011. Which might be related to the dating of the source page, August 22 2011. Looks like it used the newest data available at the time. How about we go to the source of your source and look at the updated adjusted and non-adjusted data? You linked to some note of an adjustment due to an altimeter calibration problem, which was an opportunity to also “correct for other anomalies”. I’m looking at the unadjusted data set, BTW, just so we can obviate a diversion into hollow cries of ‘fudging’. Please ignore the adjusted data to that purpose. And where the heck would that be at the link you gave? Chart shows the before and after curves for the altimeter calibration correction. After correction, the linear trend is 2.52mm/yr. This is similar to those trends available at the link on the graph, thus that site also uses the newly-adjusted data. Smokey might want to revise his opinion on Envistat, due to the very recent “Improvement” of the data, with the note you linked to dated 28 August 2012. By the chart there, the “Improvement” has yanked the trend from 0.463mm/yr to 2.52mm/yr, multiplying the old trend by 5.44. Given how much skeptics liked the old data, this new “Improvement” which brings Envistat into agreement with “the narrative”, and arriving just in time for the new IPCC Assessment Report, might be viewed with suspicion. BTW, given the magnitude of the “Improvement” to the Envistat data, that “sharp uptick in 2012” really doesn’t matter much. Although now the “curve” looks like an obvious step change, level from about 2002.5 to 2007.5 (to the record Arctic sea ice loss? ), then rising to a new level from about 2009.5 to the end of data. WUWT? For the purposes of discussing the sign of a second order polynomial, it doesn’t matter whether we use the adjusted or unadjusted curves. The result is the same. Include all the data and you get acceleration instead of decelearation. I deliberately chose to focus on the unadjusted curve to try and avoid any moaning about adjustments, but I guess that failed. Again, there is not enough data upon which to base claims of acceleration or deceleration, but seeing as you did anyway, I simply alerted you to the full data record. Don’t worry about Smokey, he’ll just keep posting that linear graph of less than half the data, that manages to turn out a negative trend, and claim that Envisat’s mean sea level product is superior to anything else. There’s nothing anyone can do about that. Don’t overlook the wind. Antarctica is the “home of the blizzard”. How much snow is blown from the continent into the ocean by those katabatic winds, whose strength will depend on the thermodynamic gradient? I propose that you do a piece on Arctic temperatures. Any increases have only been in the WINTER for decades! You are probably basing that erroneous view on the DMI temperature product, which is only for the area north of 80N. As this area is ice covered even through summer, surface temps do not generally rise above the temperature of the ice (freezing point, obviously). If and when that area starts significantly melting out in summer, the temperature will of course start rising. If you look at Arctic summertime temps (either north of 60N or 66N), then there is definitely a rise in temperatures. Following up on previous comment: Any temperature/humidity increase in Antarctic precipitation would mostly occur near the coast, where the offshore winds are strongest. A potential mass increase might be nullified by wind ablation. Another related question is the effect of wind drag on the ice shelves. mate, English is not my first, or second language, sorry. Probably half of the visitors English is not their first language. Few make a comment, most only read the comments. You are lucky for not being able to see yourself with their eyes. As a bigot, you are making an issue about your success for learning your mother’s tongue. Bravo! Explain that. Co2 was a lot less a century ago. The female bear didn’t have a chance, of course, and she is nothing but skin and bones. But she was desperate for food for herself and her cub. Seems her other cub had already died, and most likely her remaining cub will die also. And probably herself, as well. I know some don’t care as long as we can get at the oil, but that video is heartbreaking. (…) I know some don’t care as long as we can get at the oil, but that video is heartbreaking. But more likely is the female was injured or otherwise ill and couldn’t hunt herself, not that there was a shortage of food. Certainly this singular incident is unimaginably tragic, to those unfamiliar with the inherent brutality of Nature. Then the humane solution is for humans to freely hunt down and kill the excess polar bears, until their remaining numbers can be supported by the available food supply.